Without the random conversations in English and Chinese mixed in around us, it might appear as though we had stepped into a little izakaya somewhere in the countryside of Japan. Early in the evening, before the Japanese salarymen (they work late in NYC too) descend on this tiny place is a good time to quickly get a table and enjoy what is on offer here. There are about 6 tables and 6 more chairs at the sushi bar, so space can be tight at peak times. I had asked a friend who spent years living in Japan to recommend me the best udon location in New York City, and was answered with Ariyoshi. At any izakaya, it is customary to order some small plates and share it all, while keeping bottles of shochu or beer constantly coming. We stuck with the beer and left the heavy drinking to the table of red faces next to us. 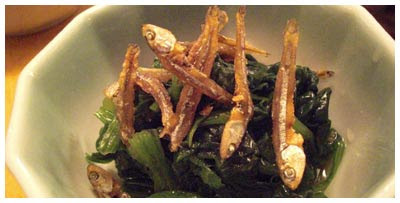 To snack on, we ordered the geso tempura ($5.50, squid legs, below top) and hourensou shirasu ($4.75, steamed spinach w/ tiny fish, below bottom). Both were tasty as expected and good nibblers while we drank and waited for our main meals. The squid was especially delicious and dipped in its sauce, not too chewy and/or squeeky like some squid can be. My friend was disappointed to learn that the restaurant was out of their special homemade moro (coarse) miso, so the oden and some other items were not available for us to sample. She did finish very satisfied though, mainly due to the hiyashi natto natuki soba ($10, below). 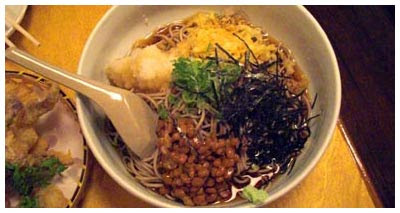 This dish is chilled soba in a light broth topped with grated daikon, natto (fermented soybean), tempura crumbs, and dried seaweed. The fermented soybean is definitely an acquired taste, overwhelming all the other parts, but the dish is incredibly unique and should at least be sampled. 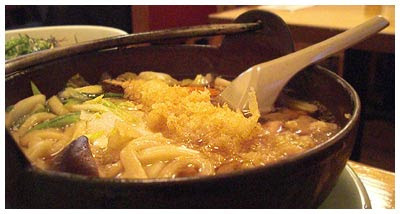 My nabe-yaki udon ($11.50, above) was extremely satisfying, and did not bring one complaint to my mind. All the ingredients (shrimp tempura, egg, and various small ingredients) were done perfectly, but I did add some shichimi (red chili pepper spice) to spice it up a little bit. The soy-based broth was a little bland without it. The noodles in both dishes were of excellent quality, and as good as it gets in New York City. I can see myself back here many times in the future, a quieter place to drink and enjoy izakaya when the teenagers of St. Marks Place just seem too annoying to stand.